THE Olaroz salt flat sits nearly 4,000 metres (13,000 feet) above sea level at the end of a road that snakes through the Andes mountains. The loudest sound in the featureless expanse is a mechanical one, made by untended pumps. They extract lithium-bearing brine from wells sunk deep below the salt crust and deposit it in evaporation pools. The concentrate will be taken to a nearby plant for processing into lithium carbonate. The operation in Argentina’s Jujuy state, an Argentine-Australian-Japanese joint venture, is one of the country’s two working lithium mines. 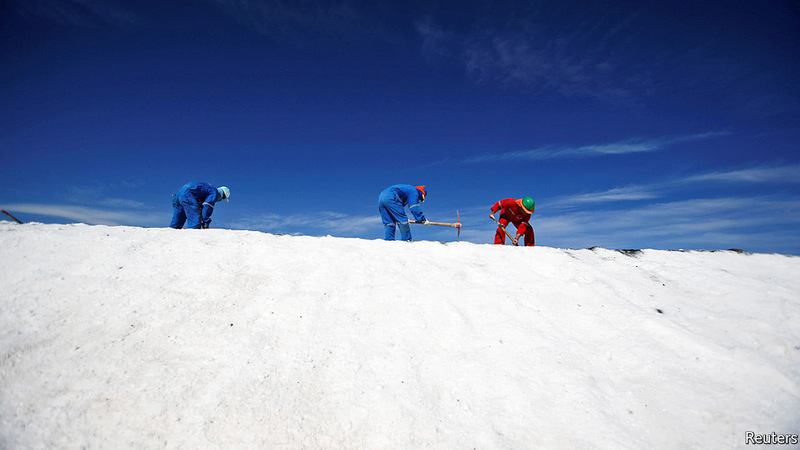 Last year it produced 11,845 tonnes of lithium carbonate, about 6% of the world’s output. This year Sales de Jujuy plans to make 17,500 tonnes. Lithium is a coveted commodity. Lithium-ion batteries store energy that powers mobile phones, electric cars and electricity grids (when attached to wind turbines and photovoltaic cells). Joe Lowry, an expert on the lightest metal, expects demand to nearly triple by 2025. Supply is lagging, which has pushed up the price. Annual contract prices for lithium carbonate and lithium hydroxide doubled in 2017, according to Industrial Minerals, a journal. 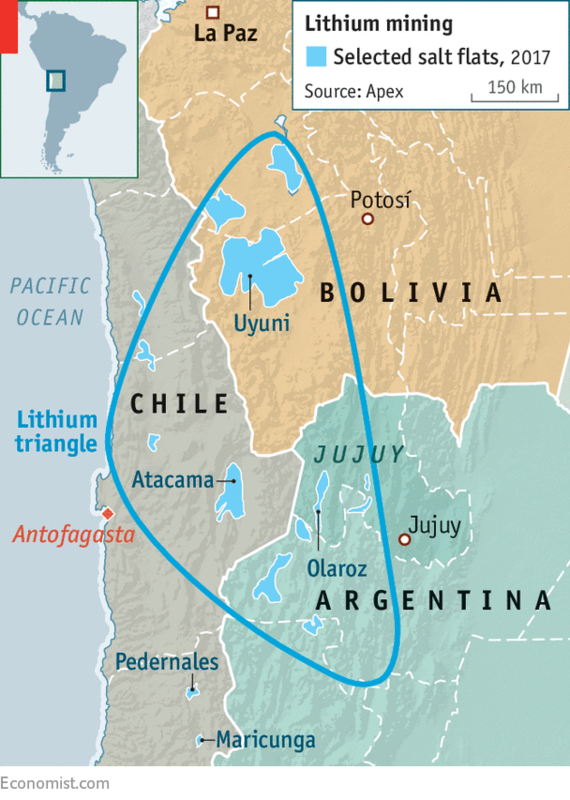 That is attracting investors to the “lithium triangle” that overlays Argentina, Bolivia and Chile (see map). The region holds 54% of the world’s “lithium resources”, an initial indication of potential supply before assessing proven reserves (see chart).